This is contentious issue, and one that is more hotly debated than a Middle East conflict. Flame wars have even been ignited over it on Wikipedia with some editors banned or reprimanded. When you drive through Lytton, British Columbia, you'll see a sign declaring themselves Canada's hot spot. Not to be outdone, Osoyoos uses the slogan, "Canada's warmest welcome." Over in Saskatchewan, where they hold Canada's all-time hottest temperature, they also try to lay claim to the prize. And let’s not forget Windsor, Ontario, where they have the highest mean summer temperature in Canada, or the south coast of British Columbia where you will find the country’s highest annual average temperature. With all this in consideration, the question remains, however, who IS Canada's hot spot? The answer is a complicated one that first requires us to define the term. If we are talking mean average annual temperature, then it's going to be around the Chilliwack/Abbotsford area of British Columbia. If we are talking about the average annual maximum temperature, then Osoyoos, British Columbia, is the hottest place in Canada. If we are talking about the place with the highest extreme temperature in Canada, then Midale and Yellowgrass, Saskatchewan, are the hottest places in Canada. If we are talking about the mean average temperature in the hottest month, then Windsor, Ontario, is the hottest place in Canada. If we are talking about the average maximum temperature for the entire summer, then it might be a Osoyoos, Ashcroft , or perhaps Spences Bridge. If we talking about the place most likely to be hottest place in the country in a given year, then Lytton, British Columbia, is the hottest place in Canada. If we are talking about the place with the most number of days above 35 degrees, then Ashcroft or Spences Bridge is Canada's hot spot. If we are talking about the place with most days above some other value, then the hottest place in Canada could be Ashcroft, Osoyoos, or Lillooet. If we are talking about the average maximum temperature in the hottest month, then Osoyoos, British Columbia, might be the hottest place in Canada. But then again, it might not. After we have defined the terms, we have to consider the margin of error. Some sites are faulty, and other sites might have used faulty instruments. Also, some weather stations have been extinct long ago, while other ones have only started up more recently. Comparing such sites can be problematic. The Saskatchwan records seem like outliers since their extreme heat waves are few and far between. Therefore, these one-off extremes should not be used as the defining criteria. Next, Windsor, Ontario, is quite warm with the warmest average mean in the height of summer, but only because the nighttime temperatures are warmer than anyone else. The case could be made that Windsor has the most hours above a certain temperature, but since this is Canada, that “certain temperature” would be too low to be considered meaningfully hot. It might make sense to use the annual mean or maximum temperatures in the tropics, but in the dead of winter, it’s hard to refer to -10 weather as hot simply because the competition is closer to -20. Hence, I’m inclined to disregard highest mean in Chilliwack and even the fact that Osoyoos, BC, has the highest average annual maximum temperature in Canada - or at least until I feel the need to “impress” my dinners guests with useless weather trivia. The southwestern interior of British Columbia is most definitely the hottest area in Canada due to frequent hot weather during the summer months. For this reason, we need to compare the various communities located there. To summarize the list above, Lytton has the most number of days above 38°C (100 °F), Ashcroft 35-37°C, Osoyoos 26-34°C, Ashcroft 24-25°C, Osoyoos 21-23°C, Lillooet 14-20°C. Where we draw the line is both arbitrary and debatable. 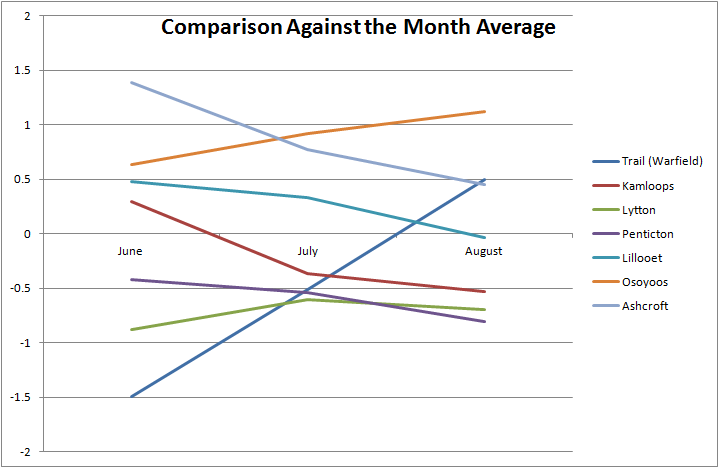 While you contemplate the merits of using the above criteria, I will continue with the average summer maximum temperatures. 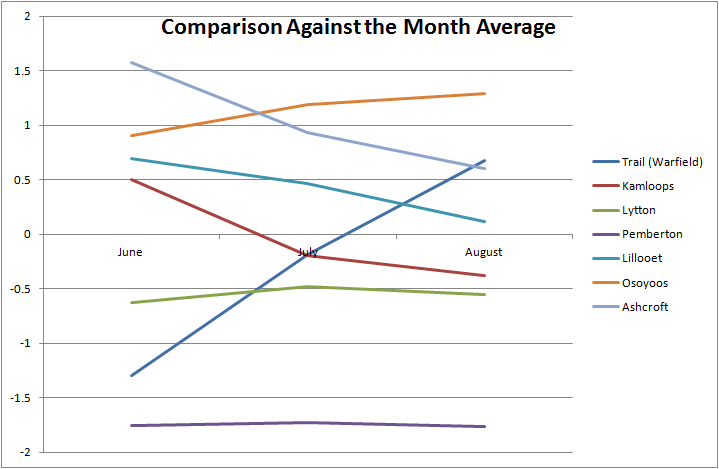 If we conclude that the place with the highest average high in the summer is the hottest spot, then Osoyoos is it based upon the data above, but what about historical weather stations no longer in existence as well as the margin of error? Note the large difference between the two Osoyoos weather stations even though they are less than half a kilometer apart and at the same elevation. Weather records in Osoyoos first started in 1954 with various stations coming and going since then. If we compare the 20 year overlap of the "Osoyoos West" station and the "Spences Bridge Nicola" station, there is no question that Spences Bridge is hotter in the summer, but when we compare the automated weather station a mere 430 metres away, Osoyoos CS, against the "Spences Bridge Nicola" station, Osoyoos is warmer. That is until closer inspection where it appears that Osoyoos might not be hotter because the Osoyoos CS weather station was reading erroneously high during the first 15 years of operation. Going back to 1954, Osoyoos could never managed to achieve BC or Canada's hottest annual temperature, but suddenly the Osoyoos CS station comes on the scene in 1990, and for 15 years the town is Canada's hot spot most years. Then just as suddenly, Osoyoos stopped recording the highest temperature of the year. Error from the thermometer is said to about 1 degree Fahrenheit at extreme temperatures, but I can clearly see a few stations reading worse than that. For examples, when North America’s coldest temperature was recorded back in 1947, the thermometer was sent into the lab because the meteorologist had to etch a mark below the lowest number. When they tested the thermometer in the lab, they found that the thermometer was off by 3 degrees. 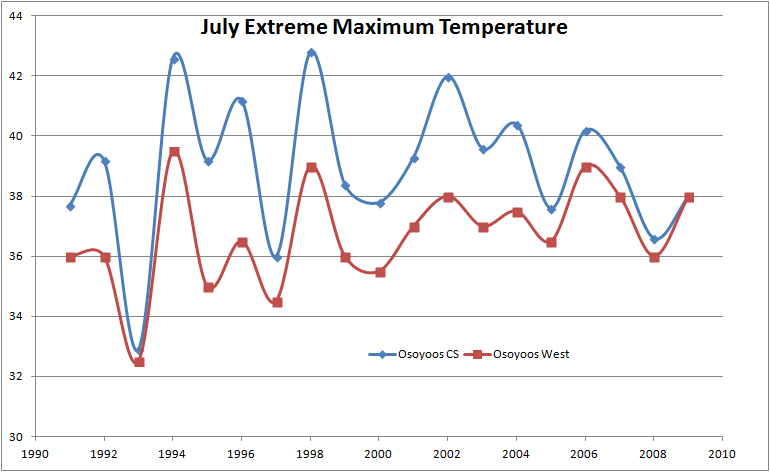 If we compare Osoyoos CS with the nearby Osoyoos West station for the 20 years of overlap, we can see that Osoyoos was reading high in July for 15 years, and suddenly started recording reasonable temperatures from 2005 onwards. This is either because the site was not set up right (you can see from Google maps that it is set pretty close to the pavement), or perhaps because of a faulty instruments. The difference occurred during extreme heat, which would be consistent with known problems with some modern electronic sensors in that the error jumps up significantly as the temperature approaches 40 degrees Celsius, and I think that this is what happened in Osoyoos. I suspect that the weather station was upgraded around then or perhaps the thermometer drifted over time as semiconductor temperature sensors will do over time. 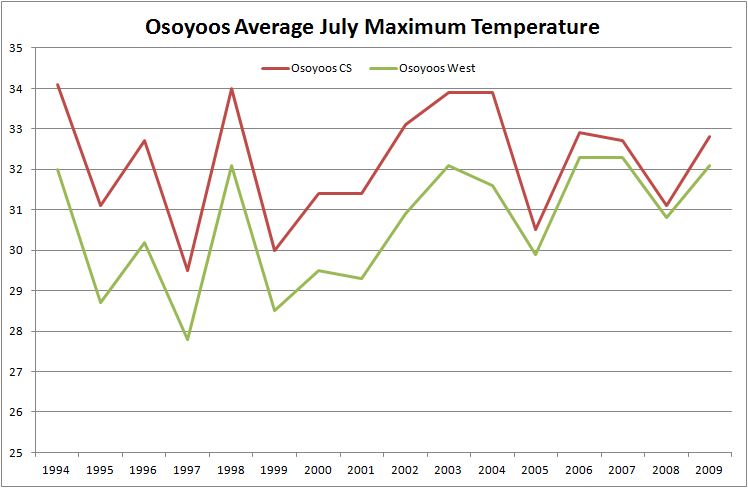 Due to higher temperatures during heatwaves, Osoyoos CS had a much higher daily high prior to 2005. Here you can see the extreme max difference. Because the two Spences Bridge weather stations are so similar, I’m included to believe those two were accurate, so I think that Spences Bridge is hotter in the summer, but that’s assuming that the Osoyoos West station wasn’t reading too low. Ashcroft could also be the hottest spot, but I’m wondering if the modern Ashcroft station (also an electronic instrument) is also reading a little high, though not nearly as farfetched as the original Osoyoos CS station. The hottest place in Canada can be narrowed down to two areas within the southwestern interior of British Columbia. The most likely location is along the Thompson River between Lytton and Ashcroft (Spences Bridge is in the middle of this area), but the extreme south Okanagan valley in and around Osoyoos may also be the hottest spot in the nation. I will leave it up to the reader to decide the hottest spot in Canada. Canada isn't warm and i'll never live there because of that. Midale and Yellow Grass, Saskatchewan. Actually the solution is extremely simple. There is no contentious, no definition issue, nothing to decide. The hottest place in a state (not "the place with the hottest summer") is the place that has the highest annual daily mean. Every other definition is incorrect and has no sense in climatology. That said, according to the 1981-2010 stats, I've found only one place that has an annual mean higher than 11° so far and that is the weather station at the university of Victoria which records an annual mean of 11.25°. That is the hottest (I'd better say "warmest") spot in Canada. Unless someone finds some other places with a higher annual mean. Pretty interesting analysis thanks for puting it all together!